The Nigerian Senate has summoned the Attorney-General of the Federation, Abubakar Malami, to explain the basis for the forgery charges pressed against the Senate President, Bukola Saraki, and his deputy, Ike Ekweremadu. The resolution to summon Mr. Malami followed a motion by Dino Melaye who said on Tuesday that “there is impending threat to democracy” and that the executive arm of government plans to enthrone “one man rule”. The senate wants the AGF to “explain and justify his action with evidence and why it does constitute gross abuse of his office”. Six senators spoke in “total support” of the motion, saying “it is time to defend democracy”. 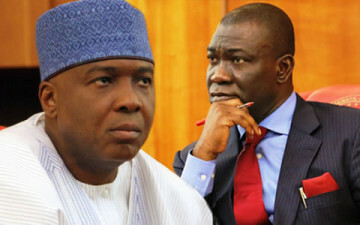 The government accuses Messrs. Saraki and Ekweremadu of falsifying the Senate Rules used in electing Mr. Saraki as senate president in June 2015. The controversial election took place against the wish of the ruling All Progressives Congress, APC, which Mr. Saraki belongs to. The senators said Tuesday the Standing Rules used for the elections of their presiding officers were not forged. Speaking after the motion had passed, Mr. Ekweremadu said, “those who are using their office to persecute others should remember no condition is permanent”.